In an effort to close the development, operational and investment gap between the Agro Perishable industry and the aviation sector which is said to be losing about 10 billion dollars in export opportunities from agricultural commodities alone, the annual Airport Business Summit conveyed a special workshop session tagged AGRO AIR LOGISTICS. The forum which was conveyed by FCI International limited led by Fortune Idu, the Managing Director, was designed to engage both sectors in a discussion aimed at resolving challenges that hinder the seamless transportation of perishable goods to both the local and global markets. With 120 delegates in attendance drawn from both the private and public sectors, representing 23 Federal airport regions, all the agencies of the Aviation sector, Nigerian Shippers’ council, the representatives from the developing airport in Bayelsa State, Nacho Free Trade Zone, Red Star Express, Federal Ministry of Industry, Nexim Bank, Kebi State etc. The workshop assessed the potential of both sectors to help meet food security challenges and enable the exploration of international markets which it believes will help save the nation the estimated 50% loss in value and quantity of perishable goods due to the poor logistics chain. This report gives an insight into the challenges identified; the potential benefit of a resolution and recommendations for closing the gaps that will address the identified challenges. The following were identified as possible challenges and gaps. 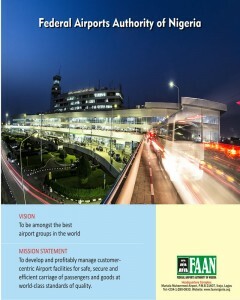 • Non Expansion of the Air Cargo apron of the Murtala Muhammed international Airport project currently abandoned. It is suggested that if the above challenges are resolved the resultant effect will be the following among other national benefits. To this end it was resolved that the following recommendations be made as part of the communique of the 1st Agro Air Logistics National Workshop of the 5 Airport Business Summit whereby the recommendations will help foster the closing of the gaps. • The establishment of a Perishable Goods Unit in all airports to enable all airports capacity to provide support for warehousing, handling and transportation of the perishable cargo through the country and beyond. • The establishment of one stop Quality Inspection machines along the air logistics chain that allows shippers to access customs, quarantine, standard organisation and NAFDAC services for both local and international freighting. perishable air cargo potential under private public sector agreement. • That Federal Ministry of Transportation, Aviation to advocate for the revisiting and review of the past air cargo programme of the Federal Airports Authority of Nigeria in order to implement the project under a PPP arrangement as government has already invested capital. Federal Ministry of trade and Investment and relevant agencies and organisations to develop policies that will revolutionize cold chain operations in Nigeria and attract investment into cold chain logistics. looking into alternative sources of energy and promote independent regional generation. • That encouragement of private sector investment is key for addressing these challenges and sustaining the process of making Nigeria an international player in the agro and perishable export sector, therefore government should create the right environment and leadership that will allow the private sector to have confidence in long term investment. extended to private investors who want to develop perishable cargo handling centres along the transport corridor. • The exploitation of unmanned aerial vehicles in agro business and the encouragement of research and youth engagement in this new technological area for possible perishable cargo delivery and to provide connectivity to remote farm areas.